The Los Cabos from Sondra Roberts is for girls who favor bold modern looks rather than feminine vintage styles. This purse is bold, but definitely not brassy. Hardware is kept to a minimum, with the textured leather drawing all the compliments. 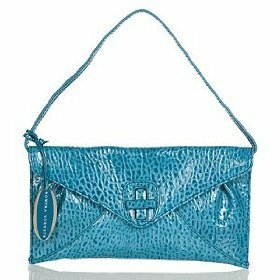 This turquoise blue clutch screams the loudest, placing it squarely in line with the current trend for all things 80s. If it's too dramatic for your tastes the coral purse is a tamer option, although it's still no shrinking violet. The colors may be on trend, but the envelope style and turnlock closure bring a timeless appeal to the design. The shoulder strap is skinny, but its leather finish should still make it more comfortable than those chain straps most designers insist on. If you’d prefer carrying your clutch the old-school way, the strap simply unbuttons underneath the flap. A slender profile and generous design offer plenty of storage space without the bulk. This clutch is much bigger than the average, allowing us to stash a slim wallet, cell phone, small digital camera, and the essential cosmetics inside. The inner front wall has two open top pockets for keeping all those girly goodies organized. The Los Cabos' modern styling is ideal for the city streets, or cocktail hour. The generous size complements that versatile design, making the $152 retail price seem like excellent value. The Sondra Roberts Los Cabos leather turn-lock satchel, a great alternative to this leather clutch.